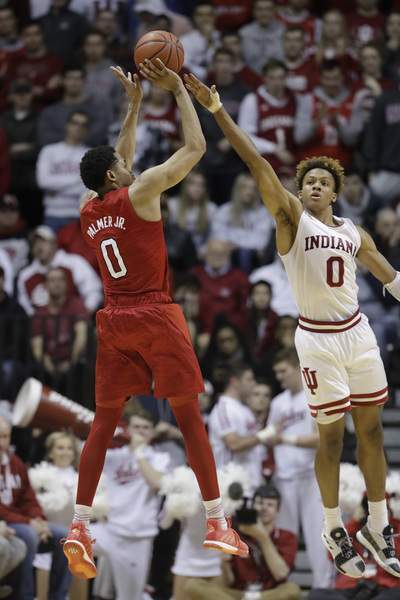 BLOOMINGTON – After Monday's 66-51 loss to Nebraska at home, Indiana coach Archie Miller and senior captain Juwan Morgan each tried to take responsibility for the Hoosiers' lackluster play. "I don't think we were all on the same page and that falls on me," Morgan said. "It falls on me to figure it out," Miller countered. It's good that it seems like there will be some accountability from somewhere, because this was embarrassing. Losing is one thing. This team has made playing hard a part of its identity and effort can mask a lot of mistakes. Tonight, the effort was nearly completely gone and the mistakes were laid bare for all to see. It was ugly basketball almost from start to finish. The loss to Duke was bad because it showed how big the talent gap is between Indiana and the country's elite teams. I'd argue, however, that this is the Hoosiers' worst defeat of the season. Coming off two straight losses, returning to Assembly Hall, playing in front of a capacity crowd that was looking for a reason to explode, Indiana couldn't even muster the energy to make it a game. With everything set up for a "get-well" victory before a tough stretch of road contests, the Hoosiers went the opposite direction, losing a third straight and putting their season at a crossroads. "We didn't have any energy, any pop, either end of the floor," Miller said. "We've been able to hang our hat on playing hard and playing tough and having a lot of guys in there contributing, and that wasn't the case here tonight. I didn't think that we played with near enough energy to compete in this league." "I felt like tonight for whatever reason, I didn't see the same team that we've had all year," Miller added. "A lot of the tougher games that we've won, we've been in tough spots. We've always had a very, very good energy level. We've always had a very, very communicating team, a team that obviously is prodding one another, plugging one another along as the game is going, and we didn't even have that tonight. We were very emotionless. We have to figure that out." Miller's diagnosis is correct, but the cure will be much more difficult because there are so many issues to iron out. The Hoosiers didn't take care of the ball, they didn't move well on defense, they went an anemic 2 of 14 from beyond the 3-point line. To make matters worse, guard Al Durham played just six minutes before he left the game with a leg injury and did not return. It's unclear if he'll miss any games, but add that to the list of players – De'Ron Davis, Rob Phinisee, Jake Forrester – who are not 100 percent. Phinisee is working his way back from his time in the concussion protocol and had just three points, two rebounds and one assist in 27 minutes tonight. Davis hardly played and Forrester didn't see the floor. One player who did see the floor in Durham's absence was Zach McRoberts. The senior captain played 18 minutes, but did not score and took just one shot. He had three rebounds and three steals on defense, but there were points when Miller was subbing him and Devonte Green in for offense/defense on a possession-by-possession basis. Neither player can get in rhythm with that happening. McRoberts will have to be more of an offensive threat if he's going to get minutes going forward. The same goes for Justin Smith. The sophomore had a couple of spectacular blocks, but went 2 for 7 from the field and the Cornhuskers were able to sag off of him all night from beyond 15 feet. The Hoosiers need more offensive firepower from players not named Morgan and Langford; that much is obvious. Now we find out what this team is made of. The coming stretch features four road games and one home matchup against No. 2 Michigan. This three-game losing streak could turn into a long, season-defining slump if Indiana can't pick itself off the mat. The Hoosiers travel to Mackey Arena on Saturday, a place where they haven't won since 2013. Who's going to take responsibility?